The plot thickens. Tuesday, a major bombshell was dropped on Hollywood as it was revealed that directing duo Phil Lord and Chris Miller are no longer directing the Han Solo movie for Lucasfilm, despite the fact that the movie has been shooting for months. Even with the drama, they are very in-demand talent, so they won't be out of work for long. In fact, they may have already found their next gig. And what is that gig? Warner Bros.' long-gestating and seemingly troubled The Flash movie. 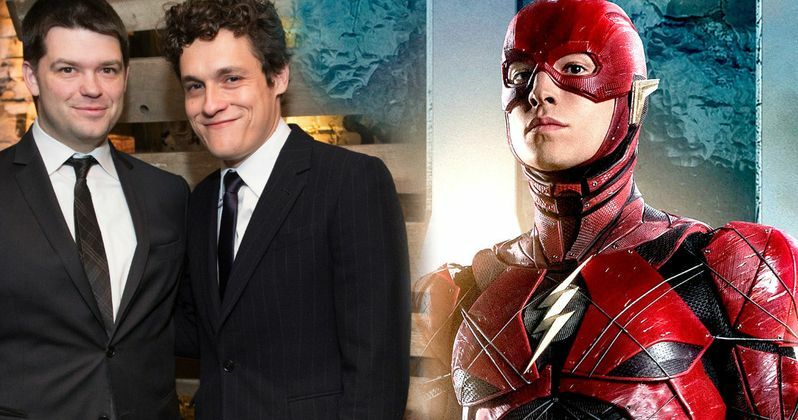 The Wrap broke the news that Phil Lord and Chris Miller met with Warner Bros. about directing The Flash, which has already lost a couple of directors in the past. Interestingly enough, Lord and Miller wrote a treatment for The Flash movie back in 2015 but, at least as far as anyone outside of Warner Bros. knows, they weren't attached to direct it. Here's what The Wrap had to say about it. "The duo met about the possibility of directing The Flash after Rick Famuyiwa left the project over creative differences last year, according to multiple individuals familiar with the project." Phil Lord and Chris Miller reportedly met with Warner Bros. during a production hiatus on Han Solo. The report also notes that it is unclear if they were already planning on exciting the Han Solo movie at that time. In any case, now that they aren't directing a Star Wars movie, their schedule is free to take over The Flash, should Warner Bros. want them to do it. Here's the statement that the duo made about leaving the Han Solo movie, which has some implications when it comes to their next project. It sounds like these "creative differences" were very significant. It initially seemed like Phil Lord and Chris Miller quit, but a report from Variety states that Lucasfilm President Kathleen Kennedy fired them, and that there were issues from the start. Why is that relevant to The Flash? Well, if they were fired, that changes things a bit. Things must have been pretty bad for Lucasfilm to fire the directors this far into production. Will that make a studio like Warner Bros. hesitate before hiring them for such a big project? Maybe. But the details of this situation are still unfolding, so it's hard to say right now. The Flash was originally supposed to come out next year, but after losing two directors, first Seth Grahame-Smith, then Rick Famuyiwa, that isn't going to happen. The script has come a long way since Lord and Miller's initial treatment as well. After Famuyiwa left, Warner Bros. decided to move ahead with a page-one rewrite. If Lord and Miller do come on to direct, will The Flash revert back to something resembling their initial treatment? Again, more questions at this point, but answers should be coming in the near future. We will be sure to keep you up to date as more details on the situation are made available.